Tot School was just off this week. It was purple week and Ethan wasn't too elated with the activities this week, but he still mastered them. Essentially he did them all once, made it known that he could recognize purple and also hated it, and refused to repeat any of the activities. 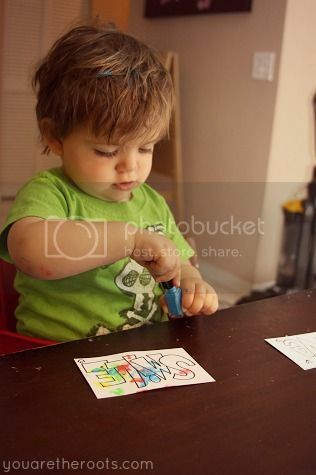 Except, of course, for removing the purple matchbox cars from his sensory bin and bringing them elsewhere in the house. Those he could forgive for being purple. What can I say? Kid does not like purple. Strangely enough, his lack of interest in purple week means for the first time ever, I don't have any pictures of Ethan doing tot school activities -- not even any of him throwing them across the room for frowning at them in toddler disgust. 1. 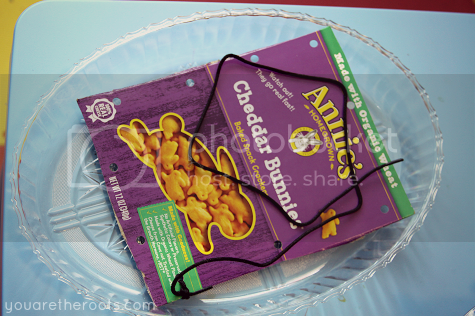 Lacing Activity - I cut out the front of a purple Annie's Cheddar Bunnies box and punched holes in it, tying a men's shoelace in a knot around one of the holes. The point was for Ethan to lace the box up. He actually enjoying this one and accepted the challenge of trying to get the shoelace to fit into the tiny holes, but not enough to do it more than once. If anything, this activity seemed to remind him that he was hungry! 2. Purple Flowers - For this, I printed and laminated an image of flowers in a pot with a butterfly. 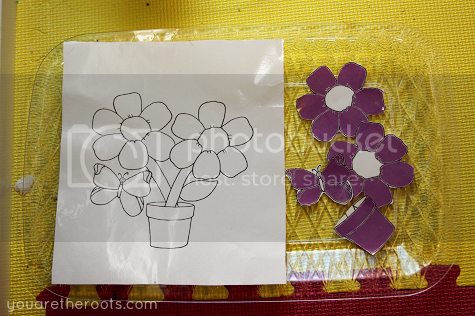 I printed a second, but colored the petals, pot and butterfly in purple. After cutting and laminating those, Ethan got to do this one like a puzzle, lining up the purple pieces with the uncolored ones. 3. Rock Activity - We had some little purplish rocks outside that Ethan loves so I brought three indoors for this activity. 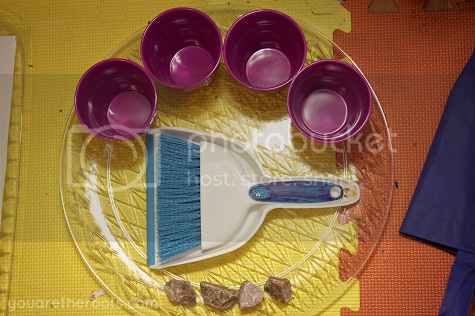 He got to sweep them up into the little dustpan and sort them into the purple cups. He didn't like doing any of this, he simply liked taking the rocks out into the living room and playing with them elsewhere. Eventually, he reminded me that the rocks belonged outside and not inside anyway. Sigh. 4. Balloon Color Matching - This was Ethan's most favorite activity of the week, likely because it didn't involve solely purple. 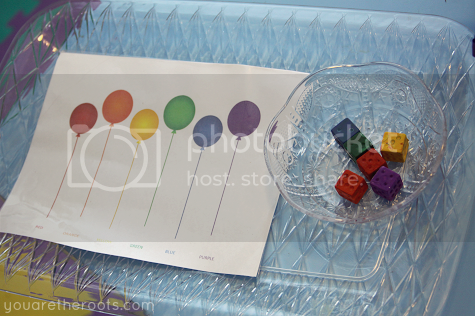 To give him a refresher on all of the colors he's learned so far, I printed out a picture of multicolored balloons and painted dice to match the balloons. Ethan got to match the dice to the coordinating balloons. 5. 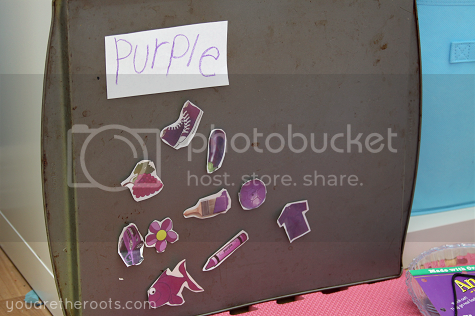 Purple Sensory Bin - I was sure this would be a hit but it wasn't. 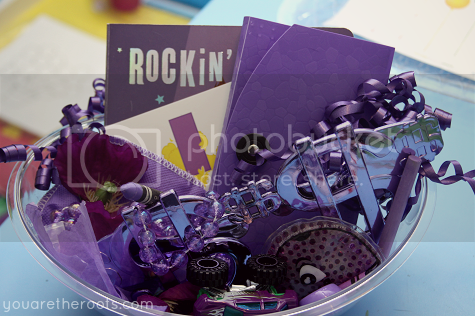 I even included one of Ethan's favorite books, Rockin' Babies, which has a purple cover. I even included huge, dollar-sign glasses from the dollar store! Apparently, nothing competes with his distaste for the color purple. Mommy fail! 6. Purple Magnet Board - Always a favorite, or at least tolerable, Ethan enjoyed putting the magnetic pieces of purple items up on the board. This week, we did some water transferring using purple water. 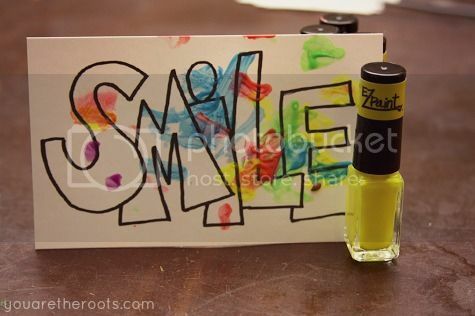 My initial mistake was adding too much water and not enough purple, so it was pretty faint. 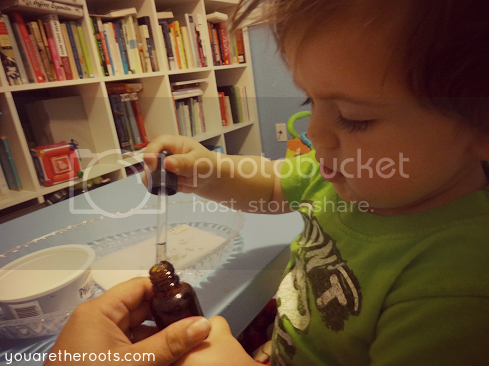 Still, Ethan really enjoyed learning to transfer water using a dropper I picked up at the health food store. 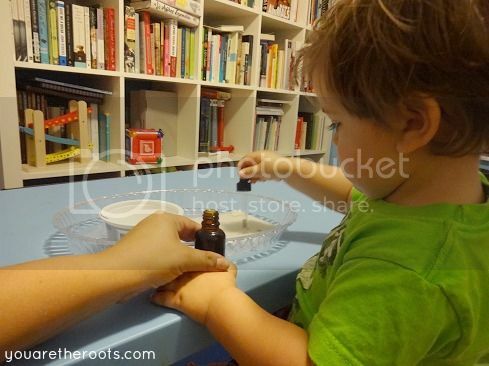 He enjoyed learning how to pick up the water and then to use the dropper to drop it onto a white sponge or into a white container. Thank you for including the story book list! We are big book-lovers around here, and I always enjoy a new title list to take to the library!! I hear you -- I love picking up new book recommendations from friends, too! Maybe next week I'll mention next to each title which was a hit and which is a miss. Sometimes Ethan chooses some...interesting ones! Haha. We had a lot of good ones this week, though! Actually, I think they were all relatively great! Aww, I'm sorry purple wasn't a hit. I hate weeks like that. Right? No fun at all when that happens. So far this week already seems to be going a lot better! You're such a good mom I can hardly take it! Bahaha! They...give kisses, snuggle, take baths, act silly, bark and lots of other things. They do everything awesomely, apparently...I don't think the book has a true plot other than "puppies rule."